Identification: This species is similar to Baeolidia moebii. However, it differs from that species in lacking extensive ramifications of the digestive gland in the dorsum, foot, rhinophores and cephalic tentacles (though it occasionally has them on the sides of its head). Its cerata are more numerous and slenderer than in B. moebii and they usually lack an obvious blue subapical band (though a faint orange patch is often present on the outer face). Unlike in B. moebii, the cerata tips have prominent cnidosacs. Natural history: Baeolidia salaamica is a moderately common species. It's occasionally found in protected rocky habitats in as little at 1 m (3 ft). However, it is most common in Halimeda kanaloana beds at depths of 10-14 m (33-46 ft). It appears to be nocturnally active, concealing itself under rocks during the day. Its egg mass is a cream or peach spiral composed of a "kinked" ribbon. (Note 1) The eggs hatch in 4-5 days in the laboratory. Taxonomic notes: The photos labeled Berghia major in Kay, 1979; Hoover, 1998 & 2006 and Bertch & Johnson, 1981 are actually of Baeolidia salaamica. It was deleted in the 5th printing of Hoover, 2006. Some sites list this species as Spurilla salaamica. 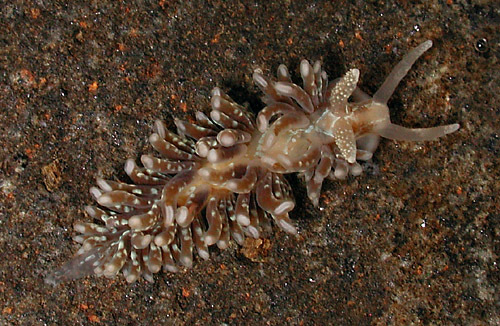 Photo: CP: 12 mm; dark; found by PF; Maalaea Bay, Maui; Sept. 28, 2008. Note 1: Perhaps, the variation in egg mass color is due to diet (both were freshly laid when photographed)?